NEW YORK, New York — We are pleased to announce that Hayastan All-Armenian Fund worldwide Telethon 2013 raised $22,661,372 in pledges and donations for numerous projects in Hayastan and Artsakh, and primarily for Vardenis - Martakert highway construction, which was approved by the Fund's annual Board of Trustees meeting. 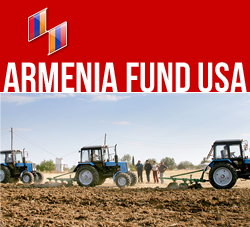 ARMENIA FUND USA: founded in 1992, was one of the first of “Hayastan” All-Armenian Fund’s 21 international affiliates and serves constituents in all states east of the Mississippi. As a non-profit, non-governmental, nonsectarian organization, the Fund represents all Armenian constituents, supporting strategic infrastructure projects in Armenia and Karabakh. The Fund has adopted a policy to go “Beyond Bricks and Mortar” to provide sustainability for projects it sponsors. 90% of our donations go towards our projects.